Figure 1. Photo of NMML researchers releasing a tagged ribbon seal and her pup on an ice floe. The NOAA Ship Oscar Dyson is in the background. Photo by Brett McClintock. The National Marine Mammal Laboratory’s (NMML) Polar Ecosystems Program (PEP) conducted an ice-seal research cruise in the central Bering Sea this spring, from 4 April to 1 May 2014, aboard the NOAA Ship Oscar Dyson. One of the primary objectives for the cruise was to deploy satellite-linked tags on ribbon and spotted seals, which are closely associated with sea ice during this time of year (Fig 1). The data collected by the satellite-linked tags will, together with information collected during similar cruises since 2005, provide information on the timing of hauling out (critical for calculating abundance estimates from aerial surveys) and dive behavior and seasonal movements (useful in identifying important habitat). The Oscar Dyson departed Kodiak, Alaska, on the afternoon of 4 April and arrived at the southern edge of the marginal ice zone of the Bering Sea on 8 April. Our field crew consisted of eight PEP biologists and one veterinarian. A typical day consisted of survey watches from 9 am to 6 pm Hawaii-Aleutian Time (HAST: UTC-10:00), while transiting along the edge of and within the marginal pack ice. 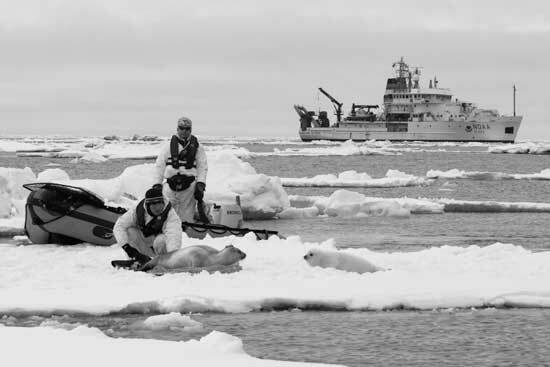 Once the numbers of seals observed and the characteristics of the sea ice warranted it, small boats were launched for seal tagging and sampling operations. Small boats were launched on 13 of 20 days in the operations area, with the remainder lost to unsuitable weather or ice characteristics; much of the marginal ice zone consisted of young, thin ice formed late in the winter that was easily moved and broken by the swell and not of the type preferred by seals. 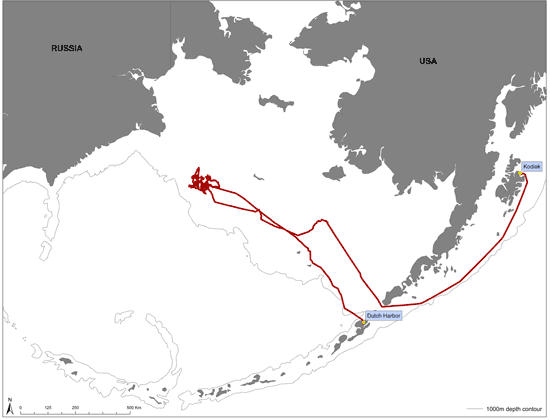 The majority of the operations were concentrated in the area west of St. Matthew Island, Alaska (Fig. 2). Figure 2. Cruise track of the NOAA Ship Oscar Dyson from Kodiak, Alaska, on 4 April to Dutch Harbor, Alaska, on 1 May 2014. We captured, handled, and released 19 ribbon, 8 spotted, and 2 bearded seals, for a total of 29 individuals. Seals were captured on ice floes with hand-held landing nets. We attached satellite transmitters to 14 ribbon and 5 spotted seals. Most of the transmitters were SPOT tags (Wildlife Computers, Redmond, WA), attached to the seals’ hind-flippers, that provide long-term movement data and haul-out timelines but only when the seals are hauled out with their flippers exposed. The remaining transmitters were SPLASH tags (Wildlife Computers, Redmond, WA) that provide more detailed information about locations at sea and diving behavior. SPLASH tags must be glued to the hair on the seals’ back or head (Fig. 1).